Last night I finished Frostbite book #2 in the Vampire Academy series. As you know I’ve been waiting for this book for over a month, so I devoured it once I bought it. Yes, bought. I got tired of waiting for the library, and broke down. I also bought book #3: Blood Promise. 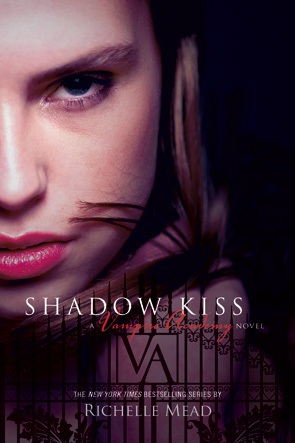 Frostbite picks up right where Vampire Academy ended. Rose and Lissa have moved on after the harrowing events in book 1, and are trying to return to normal. Lissa’s relationship with her boyfriend Christian has grown, leaving Rose feeling like a third wheel. Rose, however, is still hopelessly in love with Dimitri, while Mason is hopelessly in love with Rose. Now that one catastrophe has been abated, a new menace has risen. How will the gang at St. Vlad’s cope? Whoever said high school was hell must have attended St. Vladimir’s Academy. Richelle Mead introduces new characters that are well-developed, but not at the detriment of the others. Rose faces many new challenges in this book, while Lissa moves into the background a bit. Since I love Rose, I didn’t mind that the focus was more on her than in the last book. Her relationship with Dimitri is very realistic under the circumstances, and I’m glad it’s different from teen romances in other series. Rose Hathaway knows it is forbidden to love another guardian. Her best friend, Lissa – the last Dragomir princess – must always come first. Unfortunately, when it comes to gorgeous Dimitri Belikov,some rules are meant to be broken . . . But since making her first Strigoi kills, Rose hasn’t been feeling right. Something dark has begun to grow in her mind, and ghostly shadows warn of a terrible evil drawing nearer to the Academy’s iron gates. And now that Lissa and Rose’s sworn enemy, Victor Dashkov, is on trial for his freedom, tensions in the Moroi world are higher than ever. Lying to Lissa about Dimitri is one thing, but suddenly there’s way more than friendship at stake. The immortal undead are on the prowl, and they want vengeance for the lives that Rose has stolen. In a heart-stopping battle to rival her worst nightmares, Rose will have to choose between life, love, and the two people who matter most . . . but will her choice mean that only one can survive? Looks like the stakes will be raised even more in book 3, and I can’t wait to find out if Rose chooses her true love, or her best friend.